CHAUVET®, a leading manufacturer of LED lighting, will debut a new family of products: SlimPAR™ Pro. This new series will be available in three styles: variable white (VW), red/green/blue/amber (RGBA) and tri-colored (Tri) LEDs—shown for the first time at The NAMM Show 2011. All three high-power LED wash lights are flicker free—making them a video-friendly choice—and housed in rugged cases. The fixtures fill a small footprint—just over 11 inches high, under 10 inches wide and only 3.5 inches deep—and have hanging brackets which double as a floor stands. The cast aluminum housing protects them from the rigors of the road and helps dissipate heat. The cost-effective line also features locking IEC connectors for power, LED control displays for easy addressing and access to functions, and multiple dimming curves—for smoother dimming no matter what controller is used. The new SlimPAR™ Pro family can transform virtually any setting into a performance space—nightclub stages, intimate theaters—and is perfect for the mobile performer. The LED-fitted wash lights emit very little heat and have a long performance life. Their extreme portability also makes them perfect for uplighting mobile events and truss warmers. SlimPAR™ Pro VW is a variable white fixture featuring 36 warm and cool white LEDs. This is particularly useful when matching the color temperature of existing lighting or achieving a specific temperature for video use. 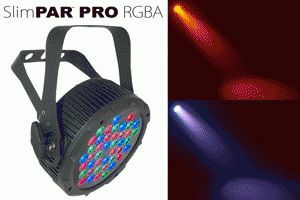 SlimPAR™ Pro RGBA is a wash light featuring red, green, blue and amber LEDs. The addition of amber offers a more complete spectrum in some of the harder-to-create warm colors and also punches up the saturation and vividness of colors in general. This unit is perfect for adding a lot of color to small performance venues. SlimPAR™ Pro Tri utilizes the latest in tri-color LEDs delivering a uniform output. Eighteen tri-color (RGB) LEDs power the fixture and the color is mixed before the lens which limits any undesirable effects of multi-colored shadows. Eliminating multi-colored shadows also allows the unit to serve admirably as front light.